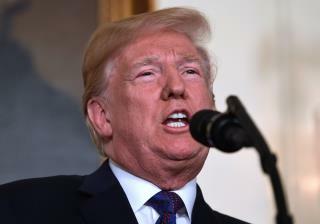 (Newser) – President Trump trotted out a familiar presidential phrase Saturday morning to praise the Friday night strikes on Syria: "Mission Accomplished!" The phrase came at the end of a tweet in which Trump hailed "a perfectly executed strike last night." He also thanked France and Britian "for their wisdom and the power of their fine Military," adding, "Could not have had a better result." A second tweet praised the US military, which he said would soon be "the finest that our Country has ever had," thanks to "the spending of billions of fully approved dollars." The initial statement was: "Now the suckers will have to believe I'm anti-Russian even though Putin owns me"
It took 105 missiles to destroy 3 building's? 225 millinm in bombs to destroy 3 building's. Ww3 is going to be very expensive.